Inspired by sufi master Pir-o-Murshid Inayat Khan's teachings and initiated in Sufi Order International (Chistiyya tariqa) - Waliya Inayat Perkins' life work is rich with inter-faith involvement and contribution towards creating more harmony between hearts. 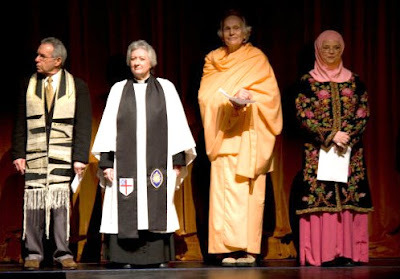 Among her many involvement as a passionate activist, she is the founder of Three Cousins, a dialog group for Jewish, Muslim, and Christian women, member of Culver City Area Interfaith Alliance and Co-Vice Chair of The Southern California Committee for a Parliament of the World’s Religions. It was not so long ago that Waliya Inayat received a vision of an inter-tarîqa mosque which would welcome sufis: lovers of God, from all tariqas, or sufi paths. Waliya Inayat described how this came to be: "We never know what inspiration will be placed in our hearts. Two years ago, I was invited to speak at an interfaith Sukkoth celebration. This congregation has celebrated Shabbat, the Jewish Sabbath, for five years, in the sanctuary of the Village Lutheran Church. An inspiration came to Waliya when she arrived for the service that “the only thing missing here was a mosque." This seed-thought grew in Waliya’s heart over the next two years as she came to know the minister and rabbi, both women, who led these congregations. The seed-thought grew and last December Waliya offered a proposal to establish a Muslim congregation in cooperation with the other two Abrahamic faiths at this location and the church Board agreed. After putting out the word to local sufis from the area, one Naqshbandi sister shared that Shaykh Hisham Muhammad Kabbani, head of the Naqshbandi-Haqqani Sufi Order of America, had told her one month prior of an inspiration to see the three Abrahamic communities in one location. Sheikh Hisham’s mureeds have been instrumental in the unfolding of Musallah Tauhid, which Waliya’s own Pir, Zia Inayat Khan, named. Inter-tarîqa weekly dhikr at Musallah Tauhid | Musallah Tauhid is a Muslim community of mureeds (members) from different tariqas (sufi path) who have gathered to found a masjid (mosque). With start there are members of six different tariqas involved. Currently it holds prayers, dhikr and potluck dinner every Saturday at 7:00 p.m. All are welcome to join. Location: 343 S. Church Lane, Los Angeles, CA 90049 (Between Sunset and Montana parallel to Sepulveda/405 freeway) | The Musallah is located in the fellowship hall of Village Lutheran Church, which also shares the space with the Ahavat Torah Jewish congregation. When Sufis Come Together | "There is something very very special when Sufis come together... to be together in a broader context; this knowing that all these different paths, all these threads of love that together weave a bigger tapestry than any one individual tariqa, any one individual path can create. it is like there is a reason, there is a very profound esoteric reason why there are all these paths, all these different spiritual vibrations ... sufism contains many different ways to love God. it is important to remember that we are part of this bigger company of friends." - Shaykh Llewellyn Vaughan Lee, in his talk in 2006 Sufi Conference, The Song of Love. (audio part1, part2). More about Waliya Inayat | Waliya Inayat Perkins took hands with Pir Vilayat Inayat Khan in January 1973. Her inner initiation came through a dream of Hazrat Inayat Khan (Pir Vilayat's father) a year earlier. Murshida Qahira Qalbi was her first teacher in the Sufi Order International (SOI). Qahira is the daughter of Fatah and Bhakti Engle; Fatah was the personal secretary to Pir-o-Murshid Inayat Khan and founded many of the SOI centers in the West.
. it is really an honor to know sister Waliya Inayat and with her invitation to be present during the earlier days of Masjid Tauhid's establishment. if you are around, i would surely recommend to come on Saturday Inter-tariqa weekly dhikr gathering. also there is another upcoming invitation: Interfaith Sufi celebration with Shaykh Hisham Kabbani on March 30, Sunday. click here for details. please spread the glad tidings if you can!